I have gathered these questions from all of the reading and personal exploration I have been doing with my peer group and supervisor. There are no right or wrong answers to these questions. I am posting them here just to stimulate self observation and insight. It is ok to be a helper. Knowing why and how you help can assist you in going deeper into your process of healing and self growth. Looking at ourselves with new awareness will bring more to the massage table. How do you help? Why do you help? How can you help? Do you often feel a need to have an answer for every question that your client has about their health and life? Do you feel uncomfortable when a client expresses their feelings or the client has an emotional release? Do you have a difficult time seeing people in pain and feel that is your responsibility to make it better or fix it? Do you have a specific religious affiliation that you feel everyone must know about? Do you often see the problems of others more clearly than you own? How did you help in your family situation? What role did you have in your family? Did you often find people drawn to you to tell you their problems? Do you feel like you always need to be available to your clients (and friends/family)? Do you often find yourself telling clients to stretch, eat better, take better care of themselves and realize that you don’t do that for yourself? Do you often find yourself telling clients your personal problems? Do you feel like you need to make a difference in your clients lives and in the world? Do you often put others needs before your own? Do you feel guilty if you can not reduce or eliminate a client’s pain or injury? Do you feel like your clients have a higher status due to income, gender or profession? Do you constantly look for new techniques that will treat the physical symptoms of clients? Do you feel unappreciated when clients don’t give back to you? Do you feel you get enough just from giving? Do you feel it is always better to give than to receive no matter what the cost? Do you feel guilty charging for your services? Do you find yourself taking on the symptoms of the clients and find yourself over-identifying with their pain? Do you often put off getting care for yourself? Weekly massages, peer groups. Do you feel depressed when your schedule is not full? Do clients often trigger feelings in you? Do you charge lower rates, thinking that people can’t afford your services or do you charge what you need to make a living? Do you feel like every disease, condition, injury or problem can be helped with massage? Do you feel like there is competition among massage therapists? Do you often feel you don’t have the necessary financial resources and enough time to take care of yourself? When you do take time to get a massage, do you find yourself analyzing the session rather than just letting yourself experience the session? Do you often feel you are the only one who can help your clients and others? Have you ever taken time off and had feelings of separation anxiety from your clients? What does it feel like when you are fixing a client? What does it feel like when you are facilitating healing? How does fixing serve the client? How do you facilitate healing? How do you fix clients? Do you find yourself giving your advice when the client hasn’t asked for it? Do you get discouraged when clients symptoms seem worse or don’t get any better? What does facilitating healing mean to you? It is common to experience any or all of the above situations at any time during the normal struggles of operating a massage business. 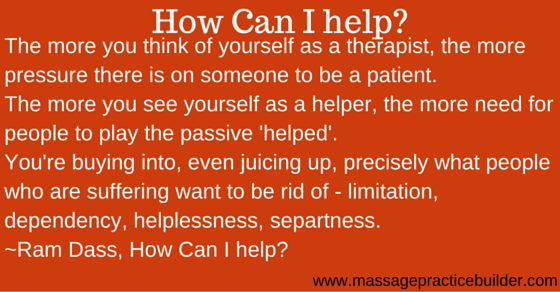 I would guess that most massage therapists deal with many of the issues at one time or another. There is no right answer or right way to deal with these issues. What is important is that you become aware of these issues and what influence you have when working with clients. Knowing this can assist you in discovering more about yourself and will facilitate your success.